It is not for nothing Chicken Noodle Soup is called “Jewish Penicillin.” It is, perhaps, the prototypical “Jewish” food. Whether there is actually something medicinal about the stuff, it’s purely psychosomatic or it is just the comfort food factor is quite beside the point. It works because it is wonderful. But I don’t get to have Chicken Noodle Soup very often. On the other I hand, the next month that goes by without my having a bowl or three of phở – the magical Vietnamese noodle soup – will be a first in recent memory. 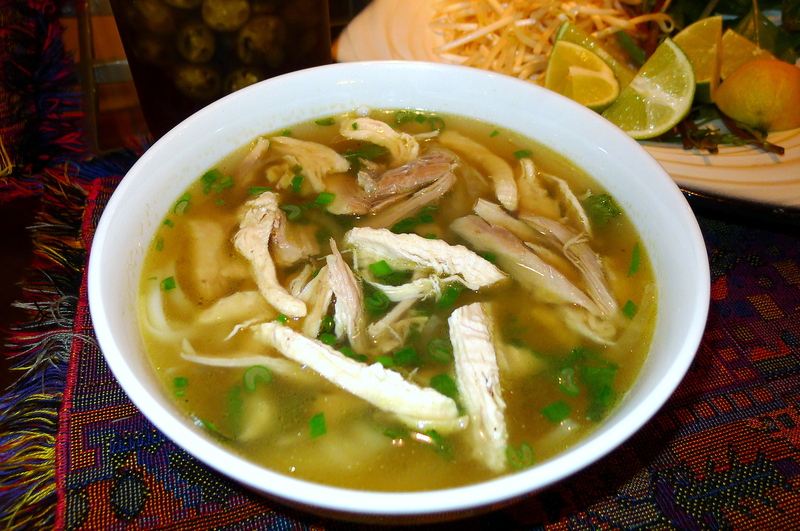 Pho is generally thought of as a beef noodle soup, but depending on how broadly you’re willing to define pho, chicken, duck, pork, vegetarian or seafood versions qualify as well. Phở Ga is beef pho’s lighter and non-bovine cousin. While I am particularly passionate about the classic beef version there is something compelling about the chicken version. Where beef pho speaks of the muscular pho ga whispers of delicacy. 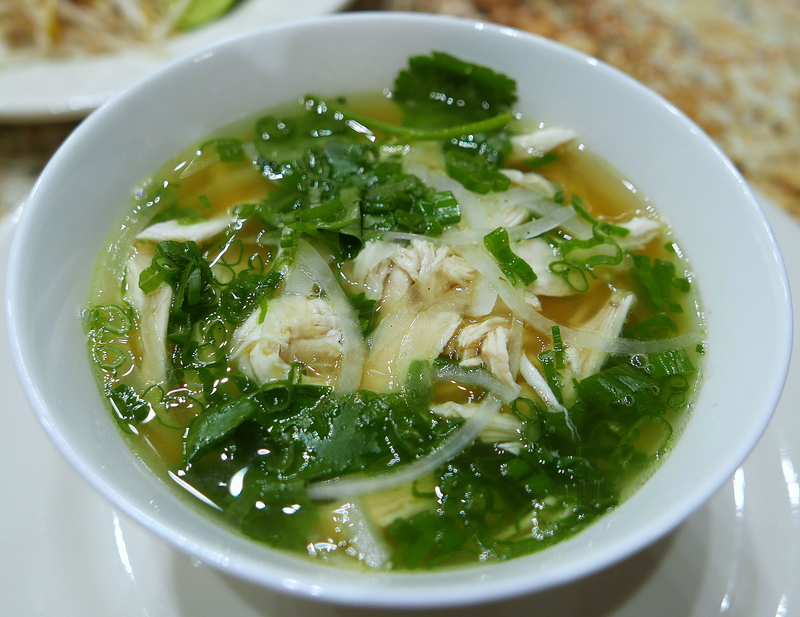 When made with craft and care, pho ga achieves that delicacy, but it does so with a broth that still manages to taste like the liquid essence of chicken. It is soothing and powerful and taps deep into the comfort vein. It may not pack the punch of the beef versions, it may not offer the variety of textures, but it offers something else: a soothing embrace. There are generally four main moving parts to a bowl of pho: the broth, the noodles, the protein and the garnishes (bean sprouts, basil, cilantro, lime and chili peppers are common). 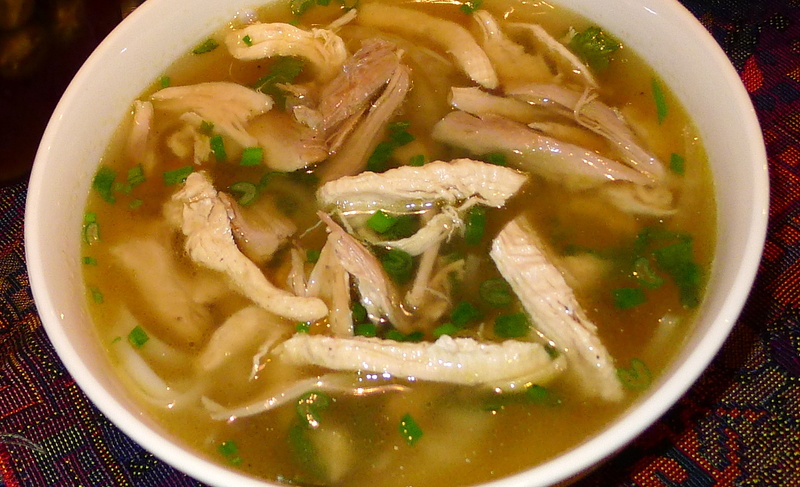 Pho broth is far more than a stock, rich and long-simmered as it is. The characteristic flavor of pho broth owes its ethereal character to charred ginger and onion, on the one hand, and a bevy of aromatic herbs and spices, particularly cinnamon, star anise, cardamom, black pepper and cloves. 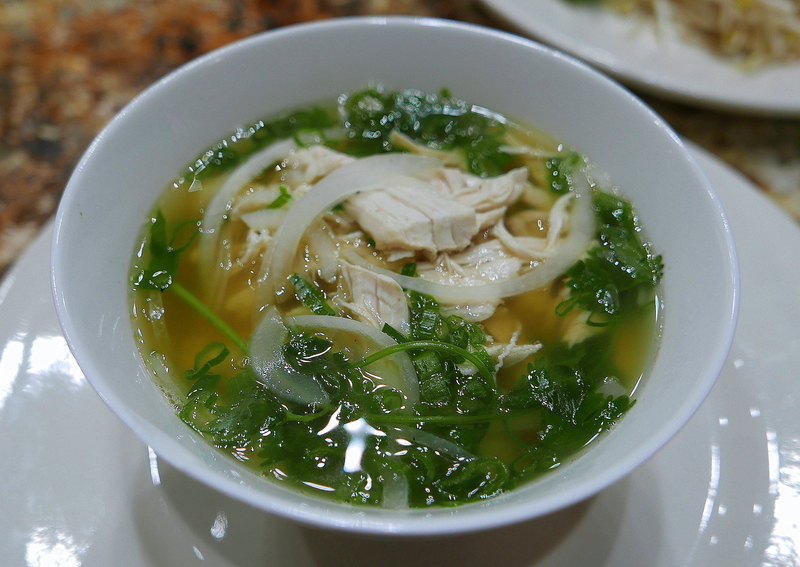 The principal problem in adapting classic pho ga to the Kosher kitchen has – for a very long time — been the fish sauce. 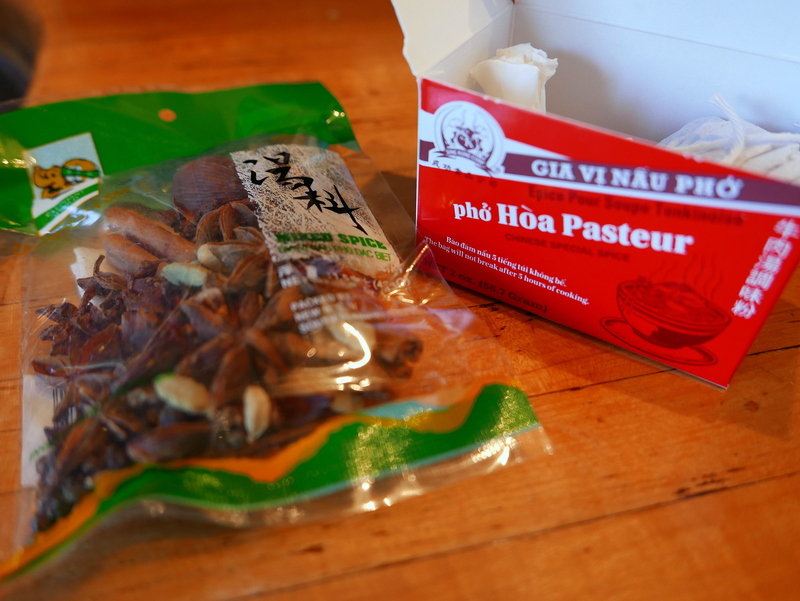 Until recently there was no readily available Kosher version of fish sauce; either Vietnamese nuoc mam or Thai nam pla. Earlier this year, though, the Red Boat brand came out with a certified Kosher version of fish sauce. It can be obtained on the internet at: http://redboatfishsauce.com/shop/index.php?route=product/product&product_id=64. While I was quite proud of my kluged-together recipe for something I called “Kosher Fish Sauce” – a concoction that was vaguely reminiscent of the real stuff — the Red Boat product is vastly superior. I don’t plan to be making a batch of my “Kosher Fish Sauce” again any more than I plan to brew my own soy sauce. What I do plan to make again is a bowl of this pho ga. Aside from the fact I love pho and the fact I love Chicken Noodle Soup it is hard to imagine how good the mash up of the two can be. This recipe will help you find out. Scallions (green parts only), thinly sliced. Roast the Ginger and Onion. Place the ginger and onion over the gas burner of your range with the burner set to the highest flame. Roast the ginger and onion over the flame until thoroughly blackened, turning as each side blackens. Alternatively, preheat the oven to your oven’s highest setting (Broil or about 500° Fahrenheit). Arrange a rack so that the top of the onion will be about 4 inches from the top burning element. Cut the onion in half (without peeling it). Put the onion and the ginger on a small baking sheet and place in the oven. Turn the onion pieces and ginger occasionally, to get an even char. The onion skin should get dark and both vegetables should should get soft. After the vegetables have cooled, rub to remove the charred skin of the onion and use a butter knife to scrape the skin off the ginger. Slice ginger into thick slices. Parboil the Chicken. Meanwhile, fill a large stockpot with water and bring to a boil. Using a boning knife (or knife of your choice, carve the chicken breast meat off the chicken and reserve for use below. With a sharp meat cleaver, whack the bird into 3 inch sections, exposing as much of the marrow as possible. When the water boils, add chicken sections (but not the reserved breast sections) and boil on high for 5 minutes. The chicken will release a lot of scum which will rise to the surface. This is normal and expected. Drain the pot, discarding the liquid. Wash the pot to be sure that none of the scum remains. When the chicken has cooled, wash the chicken parts to make sure none of the scum adheres to the chicken parts either. Make the Broth. Add 4 quarts of water, chicken, chicken breast meat, onion, ginger and all of the remaining broth ingredients to the pot and cover. Bring the pot to a boil over high heat immediately turn the heat to low. Offset the lid just enough to create a gap through which steam can escape. After 15 minutes, remove the chicken breasts and allow them to cool. Using your fingers (forks are a poor substitute) shred the chicken breast meet and set aside. With a large spoon, skim the surface of the broth to remove any impurities from the broth. Skimming every 20 minutes ensures a clear broth (a sign of a good Phở). Simmer for a total of 1-1/2 hours. Taste and adjust seasoning with more of the Kosher Fish Sauce or sugar. Finish the Soup. Prepare the noodles as per the directions on the packet. Strain the broth through a fine-mesh sieve over a soup pot. Discard the solids. Bring the pot back to a bowl over medium heat. Generally this will involve soaking the noodles in hot tap water for 15-20 minutes. Assemble the bowls by placing a portion of the noodles in each bowl. Top with the onions. Ladle in the broth and garnish with the scallions. Serve with a plate of the accompanying ingredients.